THIS is the book I have been waiting for – needing – feeling like I was wading through too many meh to finally reach this wonderful, wonderful gem. Did I mention it’s wonderful? And that it left me in a puddle of tears requiring many, many tissues to mop them all up? And that I absolutely adored that it made me have so many of those feelings and require so many tissues? 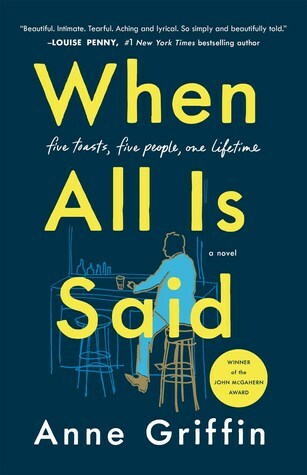 Have you started reading When All Is Said yet? When I first saw the description of this book I quickly and immediately added it to my TBR. An elderly man sits at a bar and raises his glass five times to make five toasts to the five people that have meant the most to him in his life? Hello! THIS is totally my reading kryptonite! You all know that! Remember my gushing love for books like Thomas Murphy? And The Unlikely Redemption of John Alexander MacNeil, to name just two? Every toast was incredibly emotional, heart-tugging and so, so beautifully told. I thought the first toast to his older brother Tony was going to do me in completely – that story is so fantastic and emotional and told with heart-wrenching beauty, (and perhaps I still feel the most for that one) but then Maurice keeps on with toasts to his stillborn daughter Molly, to his sister-in-law Noreen, his son Kevin and finally to his late-wife Sadie. I just wanted more time with Maurice and his stories. I fell so madly in love with him and his life story and those 5 people that meant the most to him. You have a strong inkling how this story is going to end, yet I never ever wanted to reach that part. I didn’t want to let Maurice go and the overwhelming love he had for Sadie, Tony, Molly, Kevin and Noreen. Sniff. I just welled-up and the big, fat tears are threatening to spill over. I truly think this is one I will re-read. Such a beautiful story. 5 superlative stars. I miss you Maurice (and Tony and Sadie for sure too and yes, even Molly and Noreen and Kevin).